Using our own UK manufactured light weight stone, we provide a complete design through to installation service of light weight stone cladding. Our high tech manufacturing plant allows us to accommodate a variety of materials. 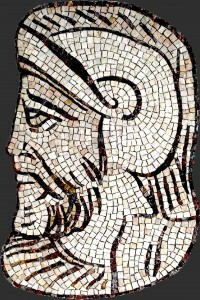 From natural stones such as marbles, limestone’s or granite’s to man-made materials such as porcelains, ceramics and terracotta. Through using an aluminium sub-framing system we can install stone facades in mere days as opposed to weeks. All of this is underpinned with a deep commitment to testing and safety ensuring our stone cladding products are fit for purpose. Traditional stone cladding normally consists of 40mm thick dimensional stone pieces usually featuring some type of tongue and groove attachment method. Whilst it will meet approved mechanical and thermal standards, it comes with a substantially large weight component. Through using the tried and tested method of aerospace honeycomb composites, we bond a far thinner slab of stone to a fiberglass aluminum honeycomb panel. This creates a superior finished product with higher flexural strength, lower overall weight and freedom in design not previously available. As a company ingrained in natural stone, we offer assistance in choosing a suitable material in both performance and finish for your project. From a simple idea on colour or finish we can help guide you towards a material that meets your criteria. Check out our material guides with regards to materials, finishes and a selector guide to help offer a introduction on choosing the right material. The materials we have in our gallery is but the tip of the iceberg. Their are thousands of both natural and man-made stone choices available. We are open to pushing the design capabilities of traditional stone. Whilst we can control the finish of the material, we can provide even further machining to create unique finishes. 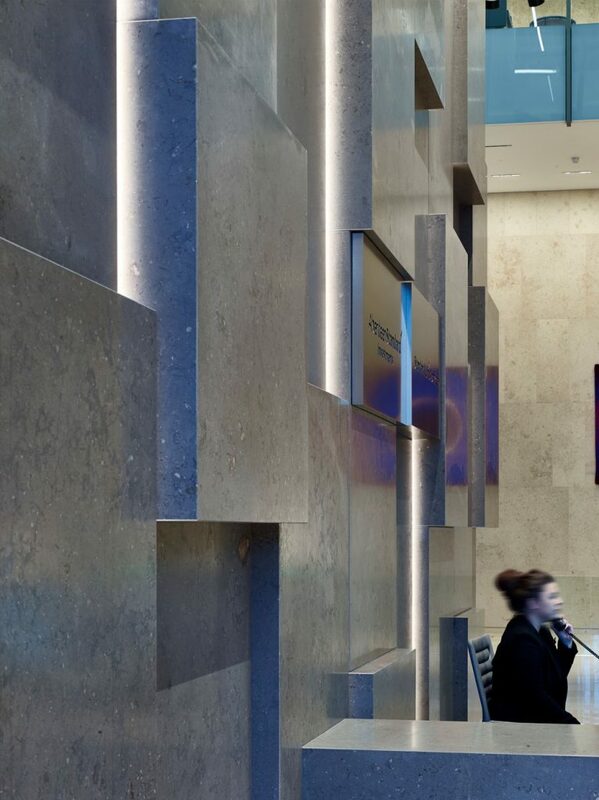 Check out our project gallery featuring a unique Jura limestone feature wall at Next High Wycombe, utilising a 3 tone machined finish. 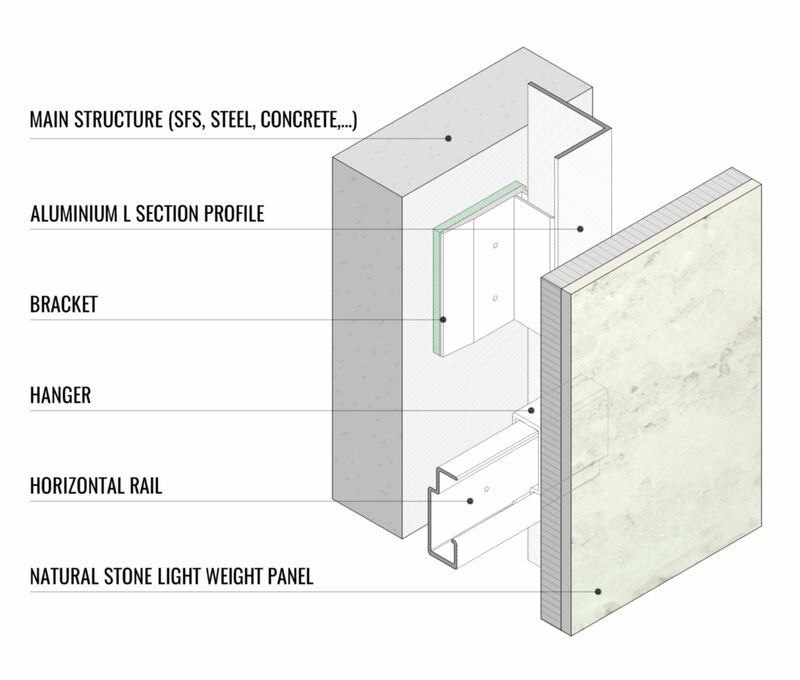 Each project comes with a bespoke aluminium sub frame system to support our light weight stone panels. Designed in-house and suitable for external structures, this system removes the need for wet installation of stone. Each stone panel is cut to size, supporting fixings and hangars attached and simply hung onto the rail system. Thanks to the stone panels low weight, the supporting structure can be reduced. This substantially impacts the overall construction of the building. A lighter support structure saves on installation time, cost and weight! No specialised labour or equipment is needed to install & no need for onsite cutting or wet adhesives required. 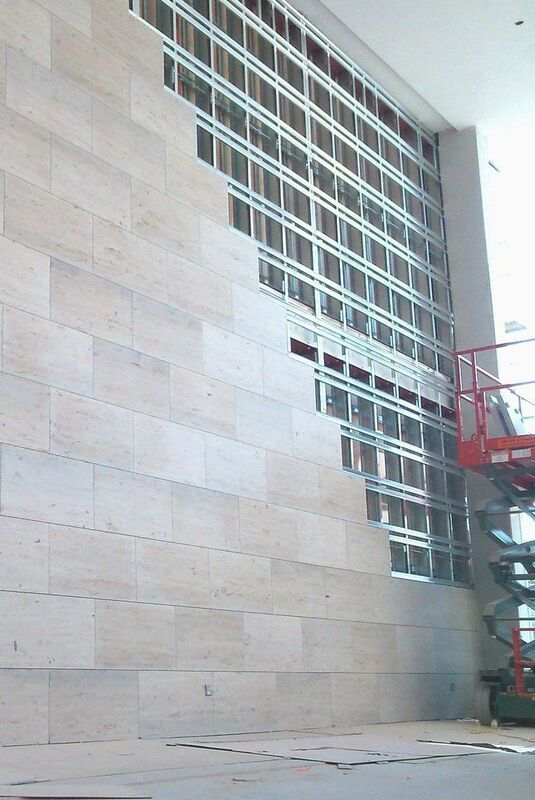 Large format stone panels reduce joint closing and speed up installation. The less pieces the better! This internal feature wall at Next Maidstone is a brilliant example of the systems simplicity. The aluminium rail system took around 7-10 days to install, with the majority of the stone paneling taking around 3-5 days to install. Overall this entire feature wall was installed, joints closed and cleaned in 2-3 weeks with a skeleton crew. 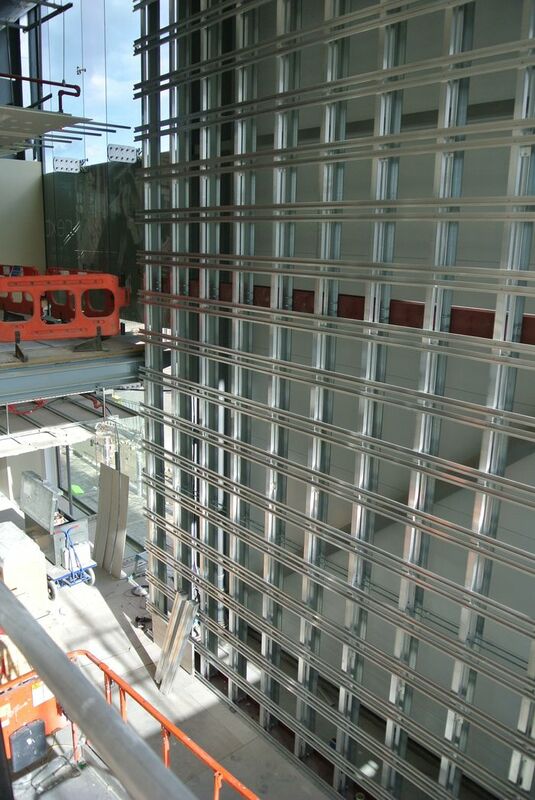 This system was bolted onto a steel framing system (SFS). Our aluminium frame is pre designed and installers only need understand 2D drawings to erect the structure. Notice how little load bearing structure is required to support the entire stone cladding system. 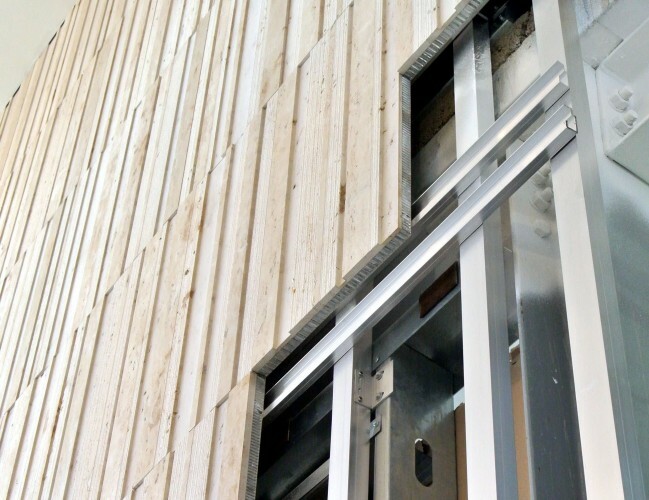 Prefabricated cladding panels are simply hung and fixed onto the supporting rail system. Quality manufactured pieces ensure they are dimensionally correct, whilst also achieving the desired material colour and finish. Joints are typically closed using a silicone sealant. Our installers are Safe Contractor approved and have the required CSCS training to work at any site across the UK. Design is fundamental to the success of our service. We operate on a collaborative basis; between main clients, principal architects and contractors to create a stone facade that works. Our in-house architects conduct hands on building surveys and conceptualise designs themselves. This ensures we have a full understanding of the task at hand. This underpins our manufacturing, as we are confident we are fabricating solutions that will fit. Through a collaborative effort we can produce a solution that works for you. Our team will analyse your project and the scopes of the works to produce the optimum design that meets your criteria. We are lean and can adapt to changing requirements proactively to mold to clients constantly changing demands. Our light weight stone is manufactured in the UK. Our own production plant can produce over 100m2 of light weight stone slabs per day. Each slab is manufactured to a consistently high quality to ensure no risk of de-lamination. All stone panel fabrication is completed at our UK base, giving us quick response times to last minute design changes. Our lean manufacturing department produce stone cladding panels to millimetric precision. The communication between our teams is constant and fluid allowing both teams to solve problems quickly. Our capabilities don’t just lie in stonework. We are capable in integrating solutions concerning the entire facade. 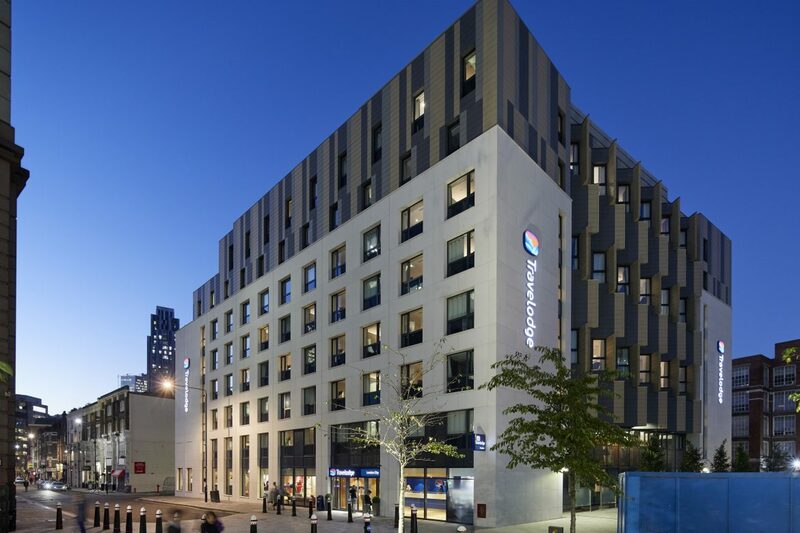 Including: Fenestration, SFS, Curtain Walling and Insulation. We perform extensive materials and system testing on all of our products to ensure their safety. 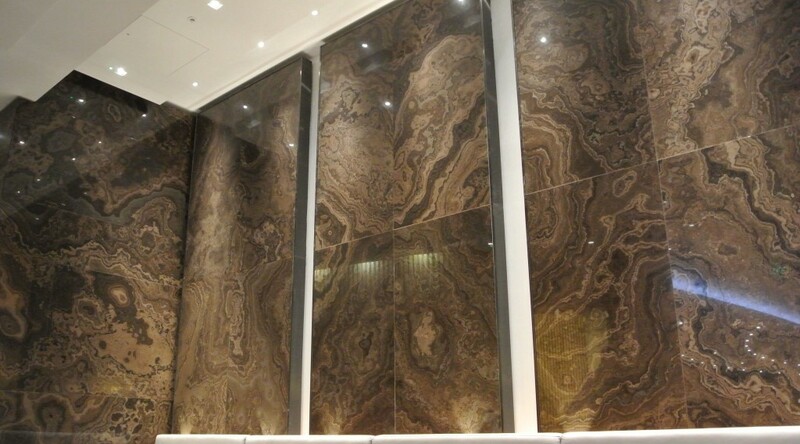 Extensive material testing is performed to ensure the longevity of our stone panels. Please contact us for further information. Check out our downloads page for an in depth case study. Featuring a beautiful earthen brown Eramosa marble, this project required particular attention to detail. The book matched panels required a high degree of design and planning to achieve its final form. Each slab required careful considerations as to its location as to keep the veins continuing as best as possible. Coupled with this was the challenging work environment of contracting within an airport. Extensive planning was required to meet specific delivery slots and work to strict work hours. For more information please check out our Air Canada gallery page.